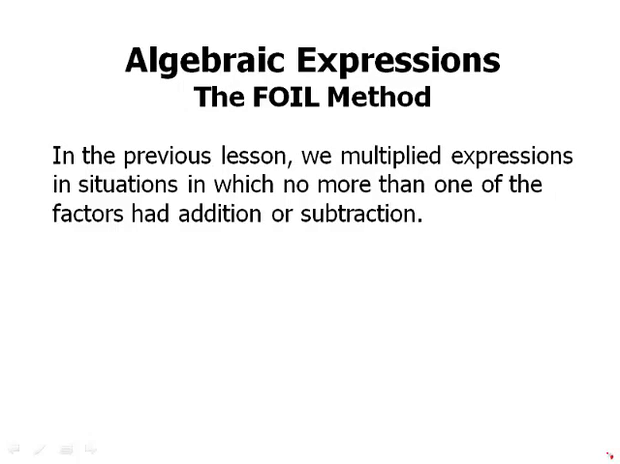 Now we can talk about the FOIL method. In the previous lessons, we multiplied expressions in situations in which no more than one of the factors had addition or subtraction. When we multiply two expressions, each of which involves addition or subtraction, how to distribute becomes a little bit trickier. So think about this, here we have two binomials, that is to say two factors, each of which involves the addition of two terms, and so how do we distribute? Well technically, we would have to distribute one factor and so let's say that second factor r plus x, that whole thing as a factor, we'd have to distribute it across the first addition. And so we get p times that factor plus q times that factor, and then once we get to that point, we'd have to distribute in each one of those terms. Distribute the p in the first term, distribute the q in the second term. And so that is technically what we would have to do to distribute. You can think of the process using the Distributive Law in that way, but there's a very convenient shortcut, summarized by the mnemonic FOIL, the word foil. So what does FOIL stand for? Well, FOIL stands for First. So, by first, we mean the product of the first two terms inside the parentheses, p and r.
Each one of those is first in its own parenthesis. And so the product of the first term sets one of the terms. Then we look at the outer pair. That is to say the very first in the first parenthesis and the very last in the last parenthesis, those are the outer ones. Then I. Those, of course, are the inner ones. The last and the first parenthesis, and the first and the last parenthesis, q and r. And then finally, we look at the two last terms. The last in the first parenthesis, and the last in the last. So those are the four pairs we're gonna look at, summarized by first, outer, inner, last. The product of the binomials is the sum of those four individual products. So in other words, if we add first, plus outer, plus inner, plus last, that is the product of the two binomials. Here's an example, the use of FOIL. So let's go through this very slowly. Here we have two binomials. The first product we're gonna take the, the F. That's the first term, so that is the 2x from the first parenthesis and the x from the center, the second parenthesis. So 2x times x is 2x squared. Now we're gonna look at the outer products. That would be the 2x at the beginning and the 2y at the end. That product is 4xy. Now we'll look at the inner products. That would be the y times the x right in the middle. Y times the x, that's xy. And then we'll look at the last. So that would be Y times 2y, which would give 2y squared. Now that we have those four individual products, we add them. And of course when we add them we have like terms. You often get like terms in FOILing. And so we simplify by combining the like terms. And that is the product. Here's another example of FOILing. So again, two binomials this time involving subtraction. So, the first would be 2x times 3x that would be 6x squared. The outer would be 2x times negative 1. We have to remember to include the negative. So that would be negative 2x. Then negative 5 times 3x. That would be the inner. That would give us negative 15x. And then the final term negative 5 times negative 1. Gives us, positive 5, and again, combine the like terms. Here's another one, with some higher powers. This is good practice for that power rule. When we multiply here we get x to the 4th times x to the 5th. And as we talked about in the previous video, what happens when we multiply powers is we add the exponents. So 4 plus 5 is 9, so x to the 4th times x to the 5th is x to the 9th. And if that's something that's unfamiliar to you, I would suggest go back and watch the previous video, or go ahead and watch the powers and roots videos where this is explained in much more detail. The outer terms, x to the 4th times x squared, 4 plus 2 is 6, so that would be x to the 6th. The inner terms, x times x to the 5th. 1 plus 5 is 6, so that's also x to the 6th, and then the last terms. X times x squared would be x cubed, and again finally, add the like terms. Here's some practice problems. Pause the video here, and work these out on your own. So, the first one, we foil out, we get those terms and they simplify. The second one, we get these terms and they simplify. The third one, we get these terms. In this context, we can also discuss a very common algebraic mistake pattern. And just as it's important to know the correct things to do, it's also incredibly important to understand the common mistake patterns. Because these common mistake patterns are very often tempting incorrect answer choices that many people pick because they make these mistakes. So here's the common mistake, if we have a binomial squared, so many people are gonna be tempted to say a plus b quantity squared equals, a squared plus b squared. They're gonna be tempted to distribute that exponent. And that is 100% incorrect. It is absolutely illegal to distribute an exponent across addition or subtraction. We can distribute multiplication across division or subtraction, that's the Distributive Law. We cannot distribute an exponent. Instead, squaring anything means multiplying it by itself. The squaring of binomial means multiplying the binomial by itself and we would FOIL in that process. So if we do this properly, a plus b squared, well, anything squared is that thing times itself, so it would be a plus b times a plus b. That's what it means to square something. Well now we have a product of binomials. So now we would FOIL, we get those terms we've combine and we get that. So this is very different from just a squared plus b squared. We get that, what's called a cross term, 2ab, the term where the two variables are multiplied together. And in fact, this is a very important pattern, this rule, a plus b squared equals a squared plus 2ab, plus b squared. It's called the sum of a square. And it's very good to be familiar with this pattern. It's very good to FOIL this out and practice this until you really know this pattern inside out. A similar rule, the square of a difference, can also be found by FOILing. This is a minus b squared, equals a squared minus 2ab plus b squared. These two formulas, the sum of, the Square of a Sum and the Square of a Difference, are good to remember, because they are two of the most important patterns in all of algebra. And again I'll make the distinction here don't just blindly memorize them, practice the FOILing. FOIL them out, and that way you'll really own these formulas because you'll understand where they come from. In summary, we discussed the the FOIL method for multiplying 2 binomials. And we discussed two important formulas. The Square of a Sum, and the Square of a Difference.